Made from glass, the this vase adds a dash of floral-based futurism to the home. 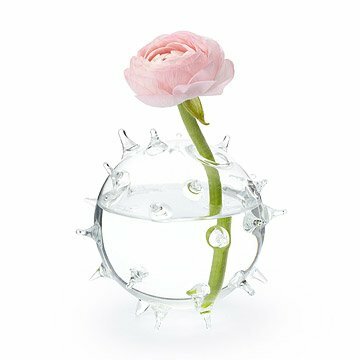 Named in honor of the history-changing Soviet satellite, this spiky, spherical vase is made from crystal-clear glass. Dramatic and extra-futuristic when arranged in clusters on a tabletop or windowsill, each vessel holds a single flower bud. Made in China. use a calcium, lime, rust cleaner for easy cleaning. This is the new go to container for rooting clippings and for occasional gifts! This little vase arrived just as described . It is truly unique and beautiful. It will be perfect for Grandma to display her single roses, or a special flower from a grandchild. It is really neat how it can be positioned on an angle because of the various glass spikes. The only negative is that it is extremely delicate, very thin blown glass. Kudos to Uncommon Goods for packing it in lots of bubble wrap and getting it here in one piece! It is well suited for Grandma's house, but not where anyone clumsy lives. I bought this for my secret Santa at work. It is a sweet little vase, very unique and great for someone who has a fun sense of style. My co-worker said it would be perfect on her kitchen window sill with little flowers or herbs from her garden. great small gift for a friend. a little small but really cool design. Elegant, but also cute and endearing. I liked the Sputnick vase so much that I ordered two--one to give as a gift and one to keep for myself. The design is interesting, and I display mine without a flower.